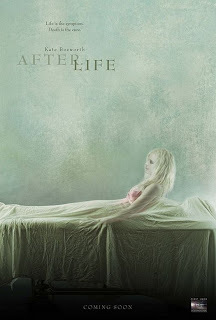 This poster has recently been released and the movie stars Kate Bosworth. Not really sure what the movie is really about. The movie’s page on IMDB is pretty empty. Its plot outline only says that its the story of a young woman caught between life and death who fights against the funeral director who has a hand in her fate. You can check it out here. But does the poster not look interesting? I thought it did. And creepy too…A spirit arising from its dead body. It kinda reminds me of the Corpse Bride and even Sally from the Nightmare Before Christmas. I mean with the pale skin and tangled hair…a bit like Sally right? Of course Sally has dark hair and is only an animated character…Could this be a good supernatural flick? By the looks of the poster…it could be.